On Monday, April 15, 2019, the Notre Dame Cathedral in Paris was spontaneously set ablaze. There is no information on why or how the fire was started, but there is speculation by local TV station, BFM- TV, that there may be a connection between the fire and the $6.8 million renovations taking place at the church. It was suggested that the fire emerged from the rafters, though no known workers were on the site. Hundreds of people watched in horror as the Cathedral began to burn, some standing speechless, others recording and taking pictures with their phones. One person Tweeted “Before the news breaks, the Notre Dame is on fire,” attaching an image of a portion of the building engulfed in flames, smoke rising from the top. The spire of the building, that up until recently held bronze statues from the 12th and 13th century, completely collapsed under the pressure of the fire. While only a portion of the myriad of prized pieces of artwork inside Notre Dame were able to be rescued, the building itself has not been so fortunate. The roof of the age old building was entirely disintegrated, and it was said that only the frame of the building would remain. 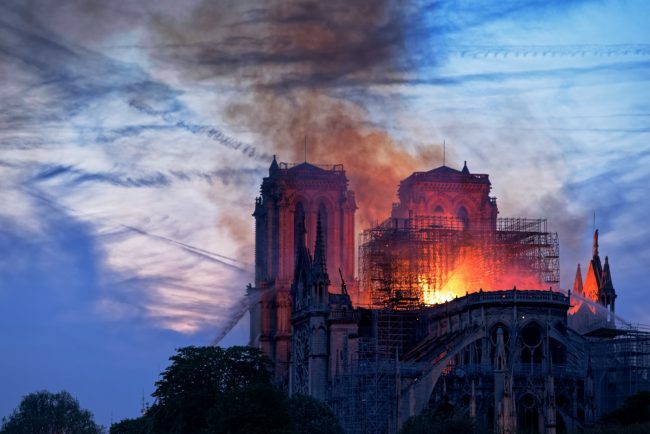 While people are grieving the loss of their beloved Notre Dame Cathedral, the cause of the fire is yet to be determined. Firefighters are still attempting to put out the fire, stating that the job could take days to complete.